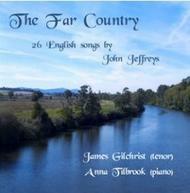 As a composer, John Jeffreys has concentrated very largely on the medium of song for solo voice and piano. He has also composed a violin concerto and several pieces for organ, but it is the merging of words and music that fascinates him. He belongs to the generation that follows Warlock, Moeran and Finzi and has drawn inspiration from a variety of authors � Shakespeare, Fletcher, Herrick, Yeats, Housman, Gibson and Gurney to name a few. Many of his songs have been recorded by Ian Partridge, Jonathan Veira and Scot Weir. This disc brings together songs from different volumes of Jeffreys published works � selected by the composer - and categorised as �Songs of Love� (tracks 01-07), �Settings of Ivor Gurney� (tracks 08-10), �Sacred Texts� (tracks 11-15), �Settings from Shakespeare� (tracks 16-18), �Evocations of place and nature� (tracks 19-24) and �A Jolly End� (tracks 25-26). Full song texts are printed in the booklet. James Gilchrist began his working life as a doctor, turning to a full time career in music in 1996. He has appeared with AAM, Monteverdi Choir, The Sixteen, The King�s Consort and many others. He has performed at many prestigious events and venues including the BBC Proms and has appeared on numerous CDs. His work is heard regularly on Radio 3. Anna Tilbrook has given recitals at all the major London venues and in festivals and recital halls throughout the UK and overseas. She is heard regularly on Radio 3. As an accompanist, she has worked with Barbara Bonney, Thomas Allen, Anthony Rolfe-Johnson, and Ian Bostridge and is the regular duo partner of James Gilchrist. She was described by BBC Music Magazine as �an outstanding accompanist� in July 2005.